If you live in Milwaukee (or even if you're just visiting), you're fortunate to be in a city full of amazing, independent, locally-owned businesses. Supporting those businesses, especially during your holiday shopping, means that more of every dollar stays right here in the community, and that the character and style that these businesses (and their employees) give to our city is encouraged. And, if that's not enough, we're going to bribe you. 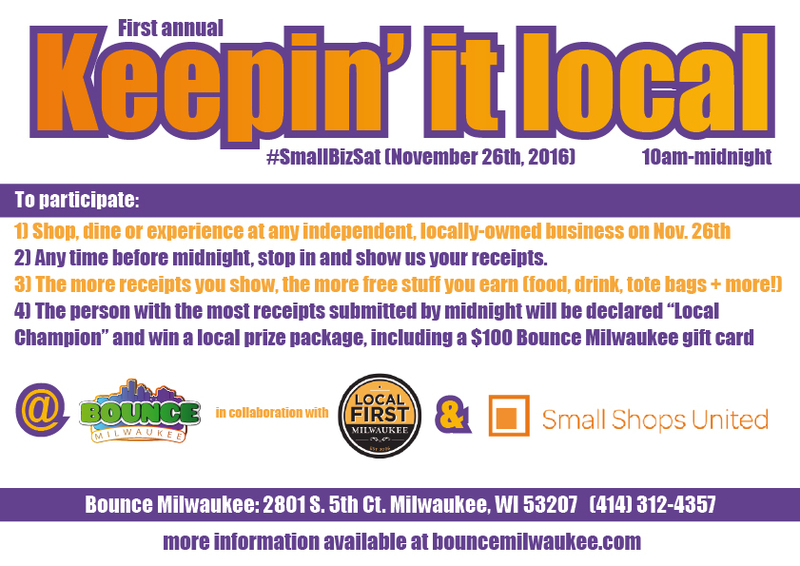 If you submit more receipts than anyone else, you'll become the reigning "Local Champion", get everything above plus a cape, a $100 gift card, and a gift basket full of local goodies from Local First Milwaukee and Small Shops United merchants! Second place (our "Local Vice Champion") also gets a Gift Pack from Small Shops United! The fine print: Merchants must meet the criteria for an independent, locally-owned business listed here. In general, franchises and "big box" stores will not count, but small businesses (that are unique to Milwaukee and our area) will. Bounce Milwaukee reserves the right to determine whether a business meets the criteria. In the event of a tie, Bounce Milwaukee reserves the right to divide up the gift basket, or to require the customers to compete in sumo suits as a tie-breaker. Small Shops United and Local First Milwaukee have excellent lists of great businesses that meet all of the criteria (and are awesome). Thanks for supporting local businesses and our employees.